I never liked history lessons. An hour of reading boring, monotonous textbooks. Cramming in the dates of the most important events. The subjective views of the teacher, the author of the textbook or the subjective criteria of the chosen curriculum. Finishing with a report card. To this day not much has changed. Here is an example. 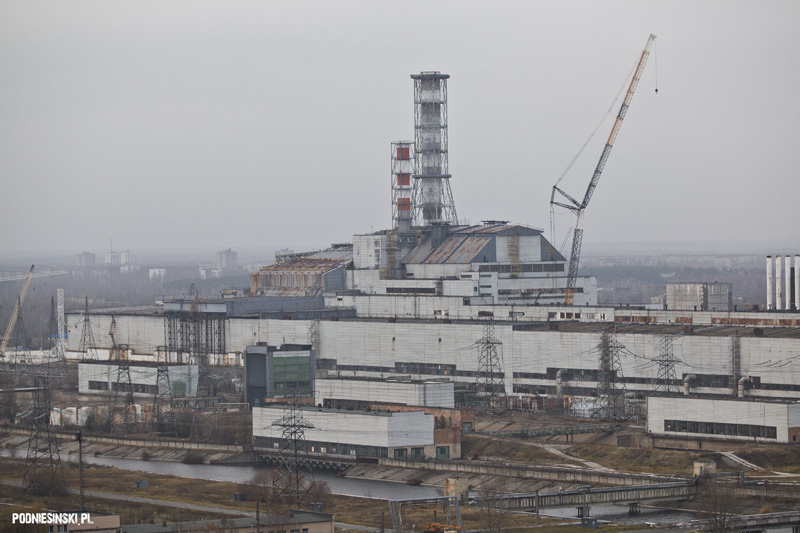 The author of a textbook for middle school students (14-16 years) called “Radiation and Protection against Radiation” published by the National Atomics Agency wrote that the events in Chernobyl were just an accident which fell within the 7-level scale of radioactive accidents of nuclear equipment in which 42 people were killed. Laconic, subdued, placating, right? 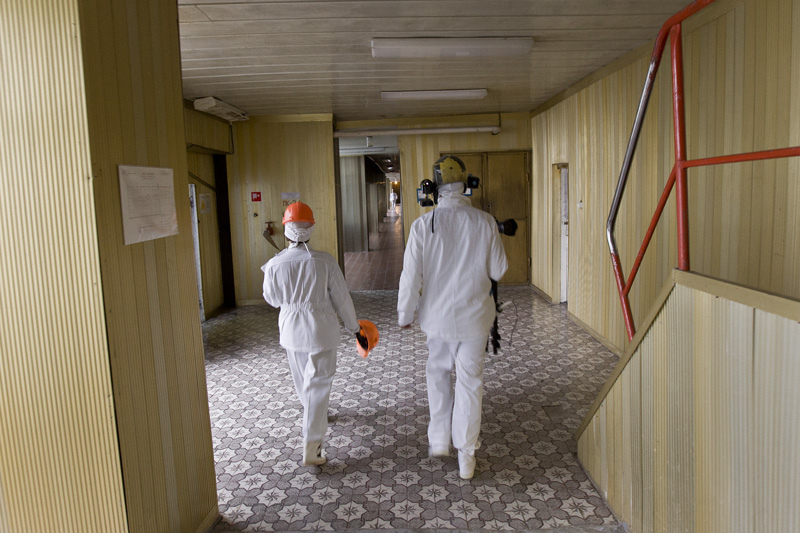 The authors forgot that the events in Chernobyl according to the cited scale were not just an “accident” but a “large meltdown with far-reaching effects”. That not only were the events on the 7-level scale, but that it reached the highest level. That the real number of victims of the catastrophe was not only the 42 people directly clearing the site of the meltdown but also thousands of people who died as a result of illnesses as a result of it. The authors, in a word, didn’t recall the actual sources of the catastrophe, the long-term health consequences, that the USSR kept true information about the catastrophe a secret. Thus, I support the viewpoint of many reviewers of the textbooks that it serves as propaganda and promotion of nuclear energy instead of presenting children with a reliable knowledge of the world around them. Consequentially, I prefer much more to get to know history by going to museums, watching old documentary films, listening to direct reports of the witnesses of events. It is much easier and more pleasant to absorb the information when you are closer to these events. It is much easier to form your own opinion, having a greater and fuller image of the reality that surrounds us. This must be where my interest in diving in shipwrecks comes from. Located several dozen metres under the surface of the water, the wreck of a military ship is nothing if not a living museum. Additionally, one in which you can touch all the objects without worrying, not receiving strict reprimands from the museum guards. Recent diving in Narvik in wrecks from the Second World War taught me the history of these events much better than many lessons in school. 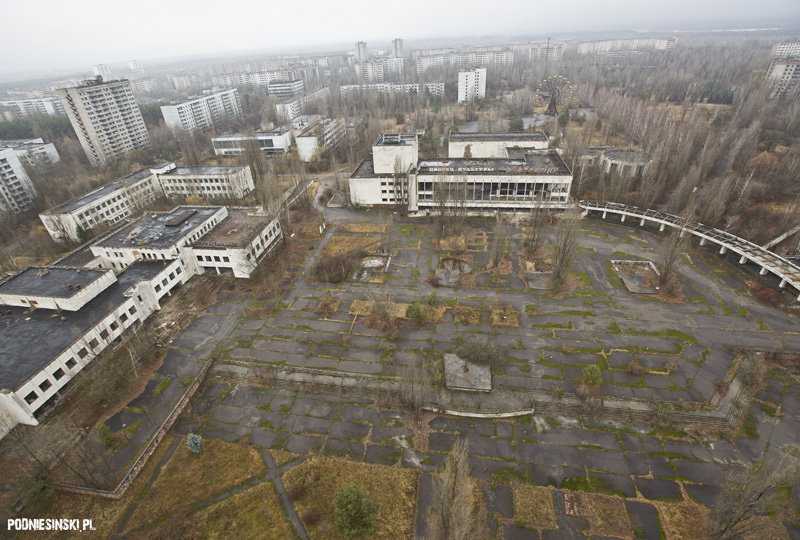 And it was no different during my last trip to the closed zone in Chernobyl. This time, thanks to obtaining special permits, I was able to get to the area of block 4 of the nuclear power plant, in other words, where everything began. Already during last year’s work on the film Alone in the Zone I was trying to obtain it, but unfortunately without success. Then as a comfort I received permission to enter the area of block 1. This time attempts to get the permit began a long time before the trip. I needed consent from 3 institutions: the Ministry of Extraordinary Situations, the Department of International Cooperation and the director of the nuclear power plant itself. Each had the right to refuse even if the rest gave their consent. But stubbornness and ongoing pressure on the clerks and dozens of phone calls and faxes finally paid off. Permit acquired! And incidentally, obtaining permission to enter with my own vehicle was a piece of cake. The abandoned zone is the ideal place to test the car before the next trip and latest project. But more on that another time. 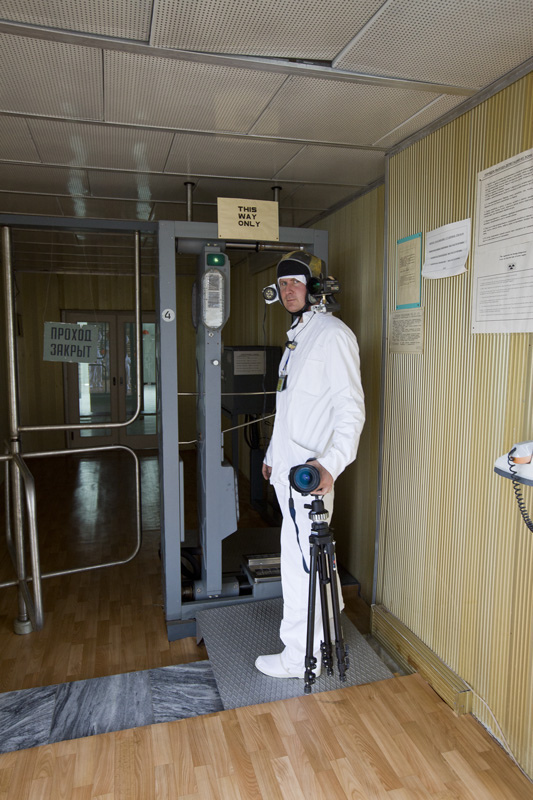 Immediately after entering the administrative building of the Chernobyl Nuclear Power Plant, named after – and how could it be anything else – Vladimir Lenin, I receive an electronic identification card, without which it’s not possible to enter anywhere. However, even with this power I’ve been given I am not allowed to move about the power plant independently and I must go everywhere accompanied by a worker of the power plant who has been provided. The system is thought out in such a way that when wanting to cross through any gates or doors you need to place your card, after which the power plant worker places his own and enters a password. On the first floor there is a hallway through which you enter the administrative building of the power plant complex. Even before entering I receive a suit of white clothes and the suggestion to get changed. During my previous visit a white apron was sufficient, this time I also receive white boots, socks, trousers, a shirt, gloves and a mask. All because this time I’m also visiting block 4, the real centre of the events, where heightened radiation still persists. At the beginning of the hallway there is another set of doors. We place our cards in, the worker enters his password. At the end of the hallway there are doors on which there are a telephone and camera. This time, besides the card and password, my guardian uses a special key and phones the power plant security, who open the doors. We enter a high security zone. Safety regulations forbid taking pictures on the premises of the power plant, so many places must only be described in words. Behind the doors there is a hallway which is over a kilometre long along which all the blocks of the power plant are located. After a while I pass blocks 1, 2 and 3 in succession. 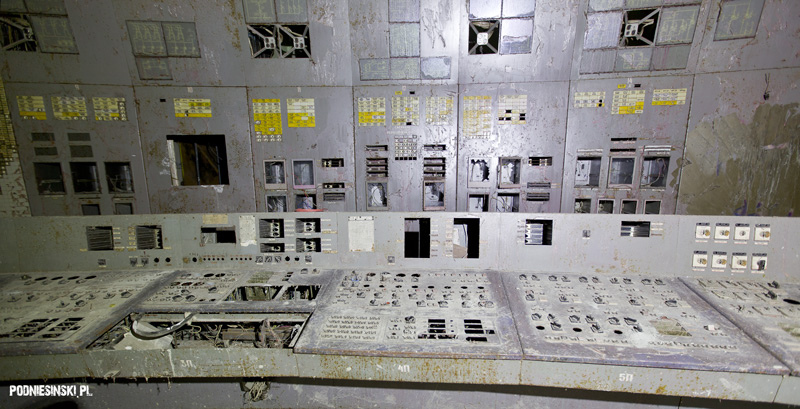 I looked into the control room of the first one again to take pictures which help me to compare it with the destroyed control room in block 4. Inside there were several people, concentrating on doing work, not paying any attention to me at all. It was here that one year ago I interviewed the block manager, which you can watch in the film Alone in the Zone. The golden corridor. A hallway stretching over 1 kilometre runs along all the blocks of the power plant. Click on the picture to see the place in Google Maps. Before entering the area of block 4 I receive a second dosimeter which measures the doses of radiation received in block 4. En route I pass many mats with disinfecting substances. Right in front of the entrance to block 4 once again we go through doors where we repeat the whole safety procedure once again. Then we put on masks and additional protective foil for our shoes. The appearance of block 4 has remained unchanged and still recalls that of 25 years ago. Exposed pipes, conduits, the same wall colours. Suddenly a guard emerges in front of me who opens the door for me and asks how much time I need to be inside the control room. I previously heard from another power plant worker that it’s only possible to be in there for a few minutes so I said that five was enough. I turn off the camera, lighting and enter. 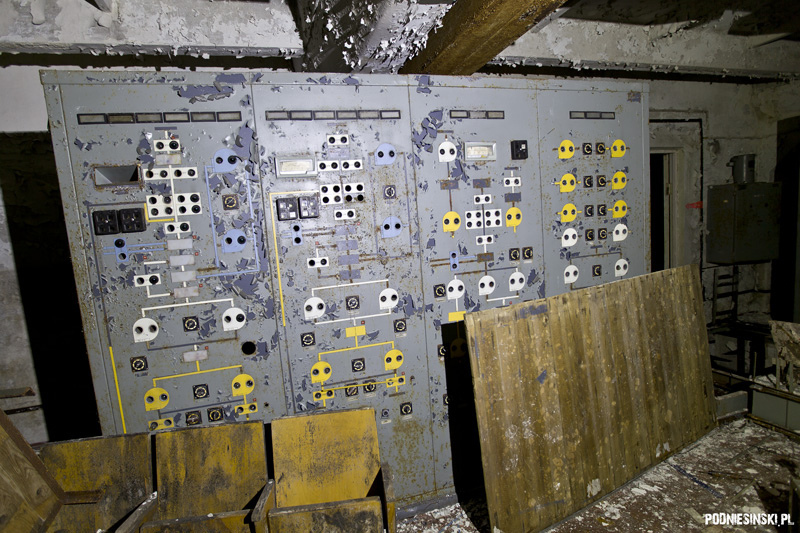 Control equipment of block 4. Click on the picture to see the location of the place on Google Maps. 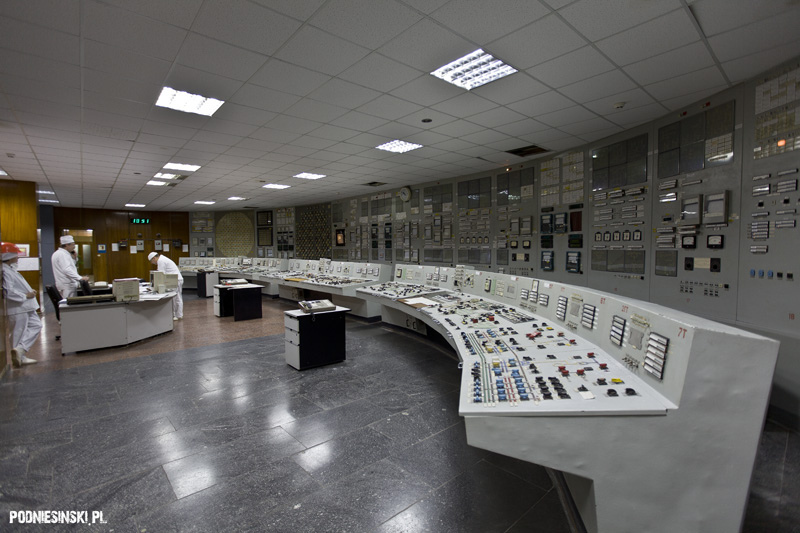 On the left a newly built wall separating the control room from the reactor. In this place on the nights of the 25th and 26th of April, 1986 an experiment was carried out which was meant to indicate how long in a meltdown situation, that is after the shutting down of the generator turbines, would the kinetic energy of their revolving movement produce enough electric energy for the needs of emergency control of the reactor. 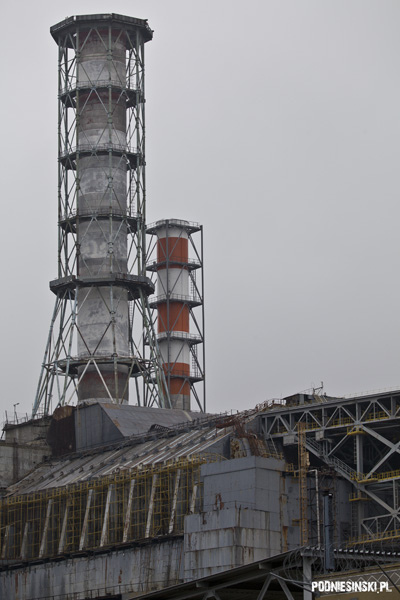 As a result of a series of several successive events, starting from the poor construction of the reactor, the safety procedures and inexperienced workers, it led to the meltdown and explosion of the reactor. It was in this place that history changed its course. Today the interior of the control room of block 4 bears little resemblance to that of 25 years ago. The majority of the equipment, buttons, indicators and dials have been taken down. 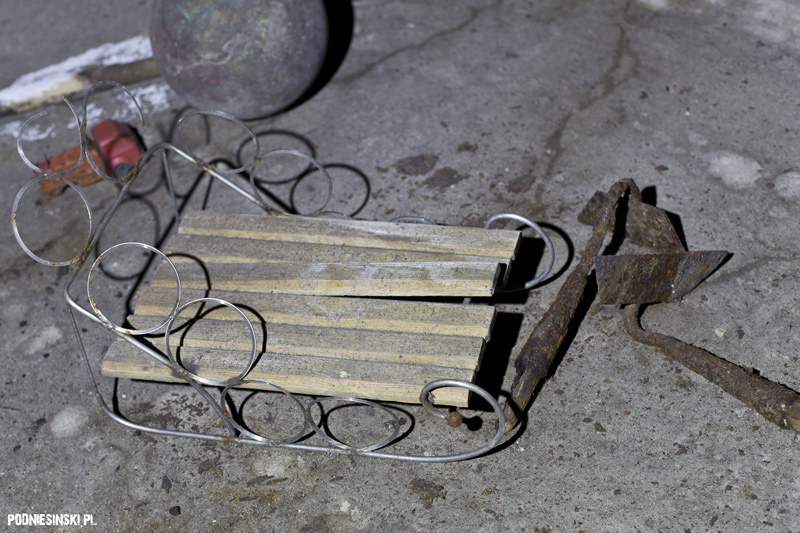 After deactivation they were used for replacement parts for the remaining functioning blocks of the power plant. Quiet, darkness, dust. Fortunately thanks to my previous visit to the non-destroyed block 1 I know the purpose of specific equipment. Opposite the control panel you can see a recently built concrete wall, the effect of work on building the new sarcophagus. Soon the control room as well as the whole building will disappear, covered by a new, gigantic sarcophagus. Its construction has just entered a crucial stage. 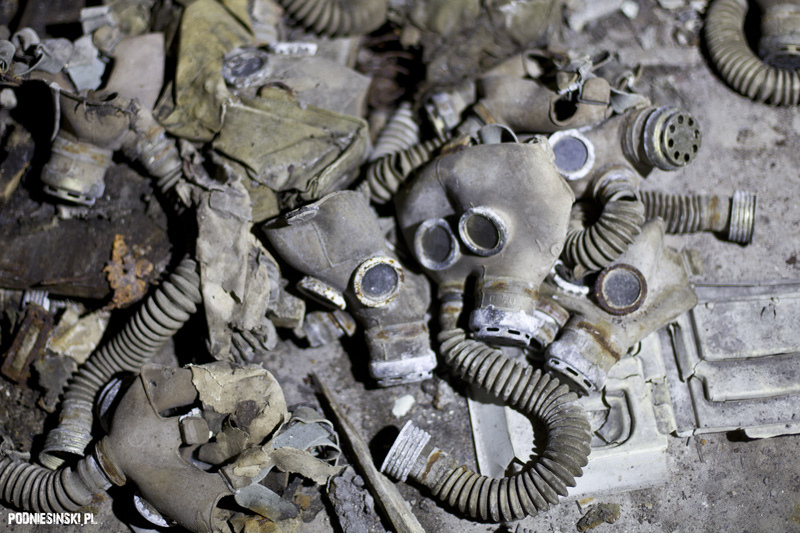 After coming out of block 4, we give the dosimeters back and throw out our masks, gloves and foil shoe protectors. The return trip is more obligatory walking through dosimetrical gates which check that we haven’t accidentally become contaminated. It was obligatory to walk through dosimetrical gates. On the outside the most visible sign of the oncoming changes is the construction of a new ventilation chimney. It is meant to replace the old one, already highly faded, with white and red stripes. 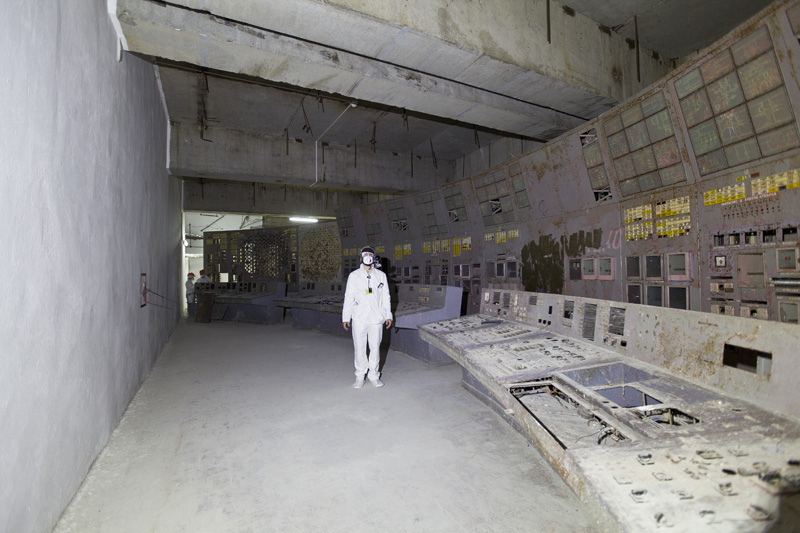 Since the time of the catastrophe it has become the most recognizable element of the power plant and the whole closed zone as well as a symbol of the nuclear catastrophe. This is the only moment you can catch both chimneys. Soon the old one will disappear irrevocably. The construction of the sarcophagus is entering into a crucial phase. View from the roof of block 5 onto blocks 3 and 4. Pripyat at a distance. Click on the picture to see the place where the picture was taken. The visit to block 4 was the most important, but not only, reason for visiting the zone. The second was taking pictures of the zone from the air. Late autumn or early spring are the best times for taking this type of picture. The buildings exposed by a lack of leaves become more visible. It’s true that there were slightly fewer permits required for flying over the zone by helicopter, but poor atmospheric conditions could damage the plans more effectively than any clerks. As a result of fog and low clouds, none of the 4 days were suitable for a flight. On the last day, when it was no longer possible to wait, I took the risk and summoned the helicopter. 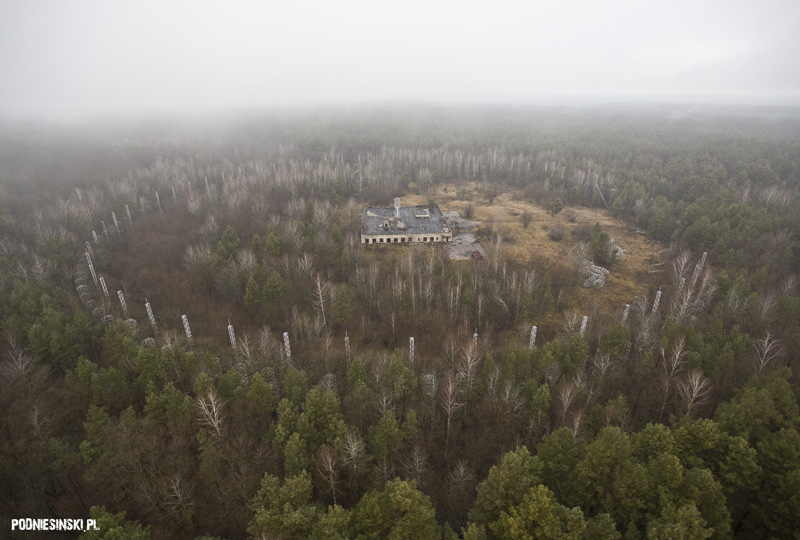 After about an hour, above Chernobyl the loud noise of a helicopter flying overhead resounded. The clouds were so low that it wasn’t even possible to see the helicopter. It was good that it had at least stopped raining. MI-2. Click on the picture to see the location of the airport. 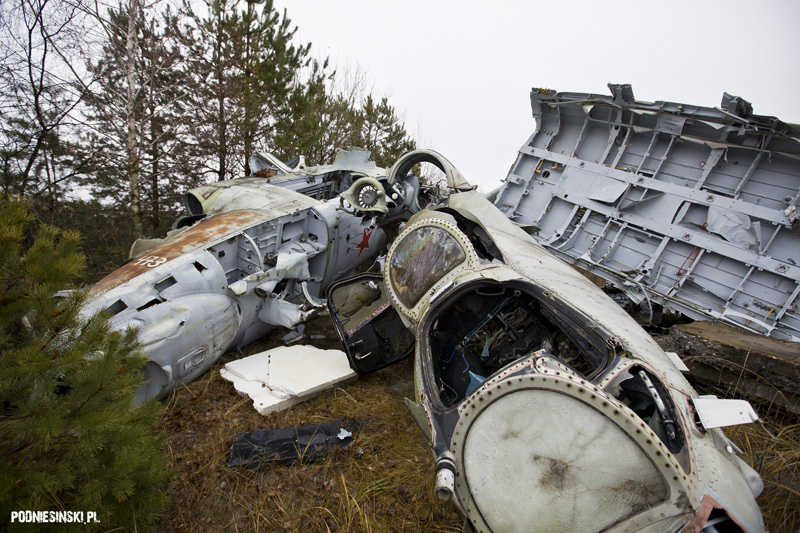 I drove up to the small military airport where, after a moment, an old, rickety MI-2 landed. Inside there were several batteries attached to the helicopters which, as I believe, were supposed to help it start again. I wavered for a moment, but I thought that since it made it this far it can probably hold on a little longer. 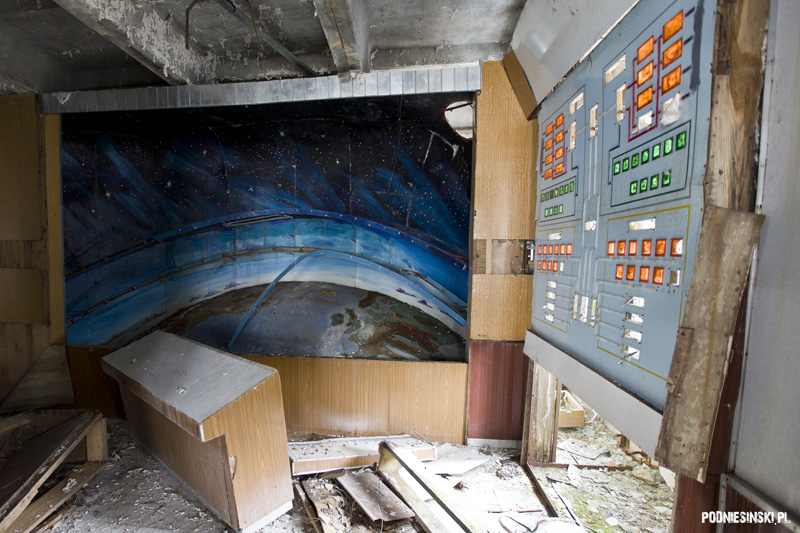 So I asked about taking down the door in order to take pictures more freely and I established that we would visit the places which happened to also be illustrations of the current report, which is to say: Chernobyl, Pripyat, Chernobyl-2, Rossoha and Buriakivka. And we’re off. 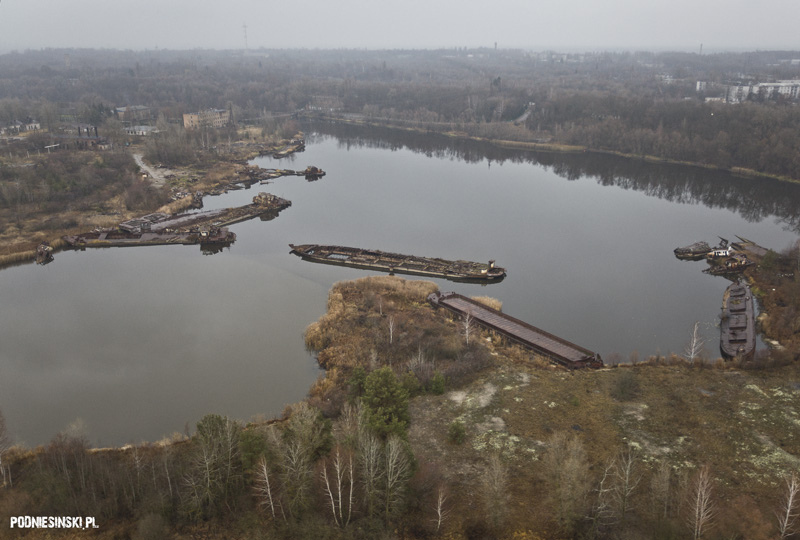 River port in Chernobyl. Wrecks of barges. Click on the picture to see the location of the place on Google Maps. 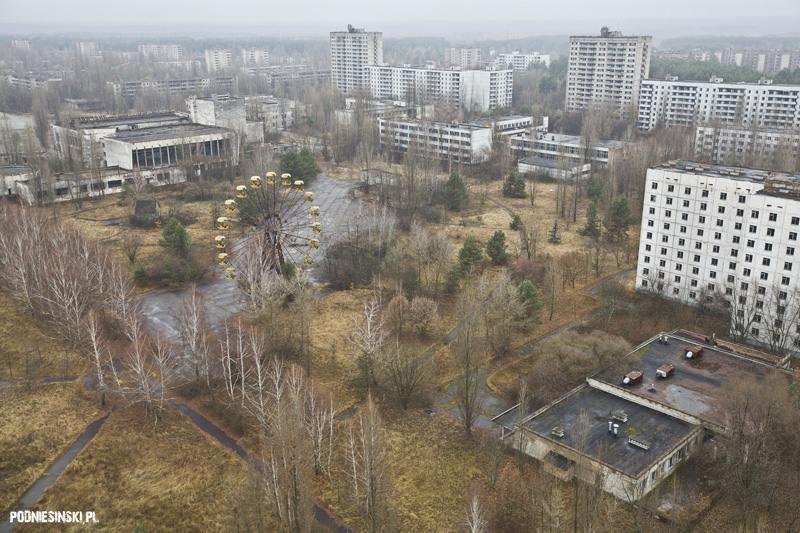 Centre of Pripyat. Cultural Centre. Fun fair with Ferris wheel from a distance. Click on the picture to see the location of the place on Google Maps. Jupiter factory. 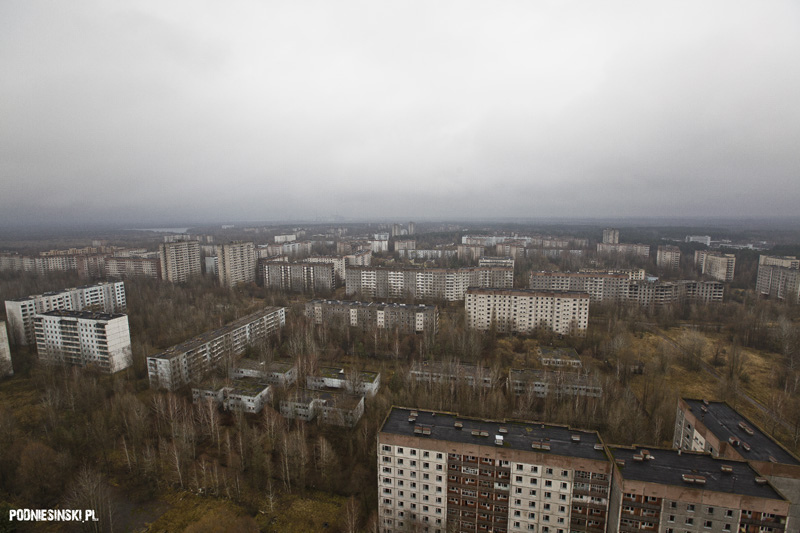 Pripyat at a distance. 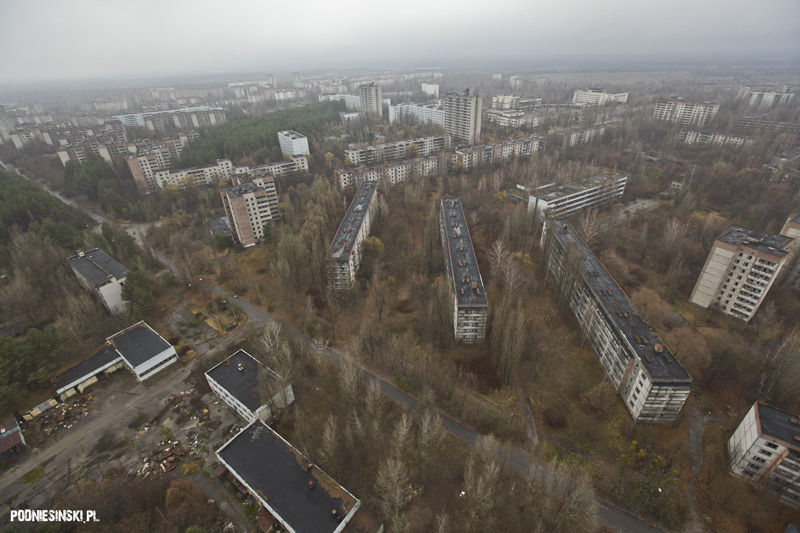 This time I decided to dedicate my visit to Pripyat to rarely visited places. 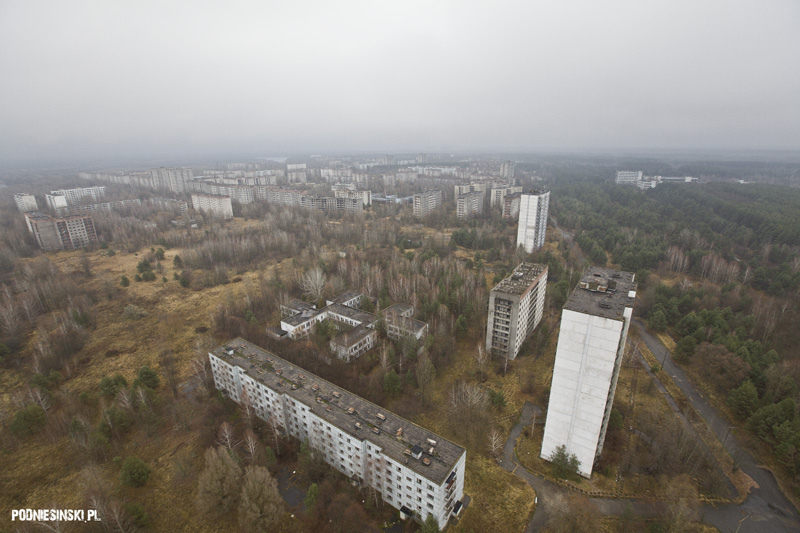 In Pripyat, which is visited by more and more people each year, are there still such places? Yes, there are. Basements. The majority of residential buildings don’t have them, but public buildings, such as schools and the kindergarten had to have additional places to store unnecessary or unused furniture. The location of the rooms under the surface of the ground, lack of windows and complete darkness hinders the encroachment of the destructive effects of nature, tourists and looters so it’s still possible to find many interesting and well preserved objects. 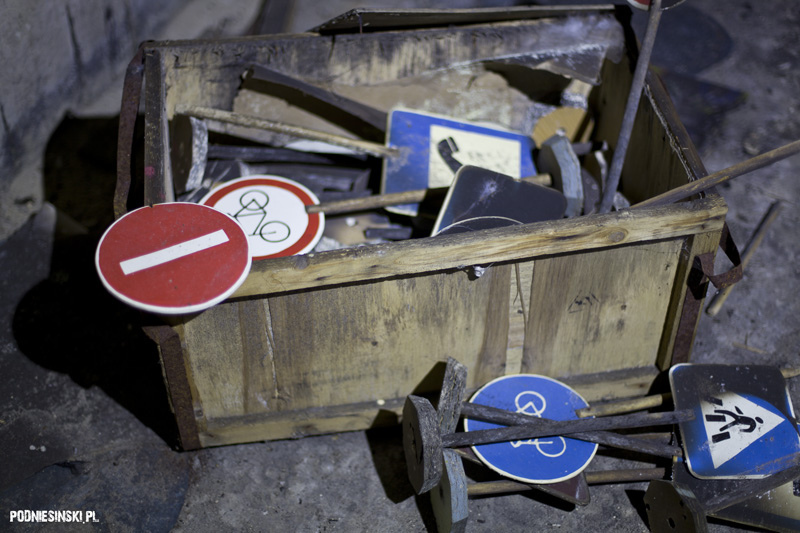 Miniature models of road signs. 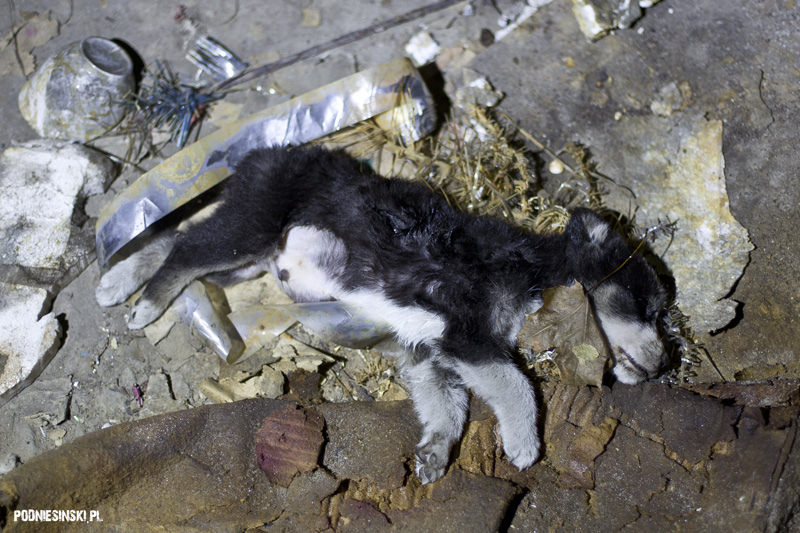 In the basement I unexpectedly came across two puppies. 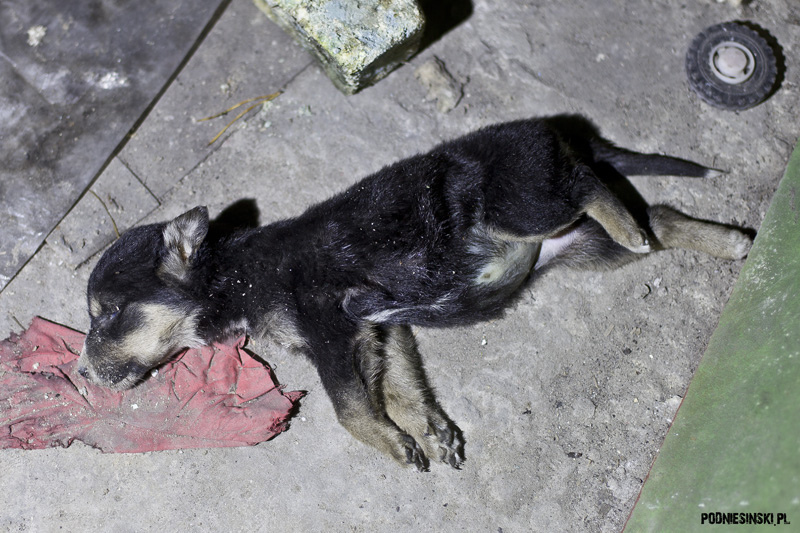 They were lying on the ground motionless and gave the impression that they were sleeping. Unfortunately they were dead. Judging from their appearance, they must have died recently. I didn’t have to wonder for long about where they came from. On the first floor of the kindergarten, among metal children’s beds, I found the answer. 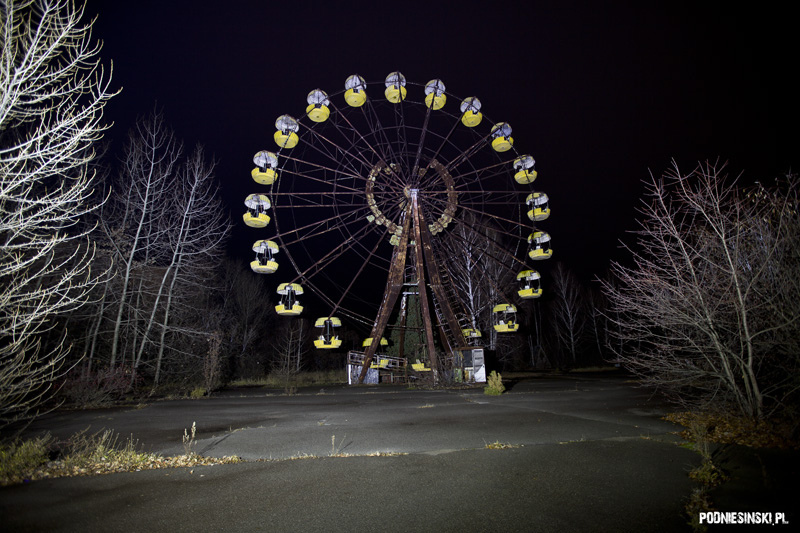 Speaking of darkness, you can’t miss a night visit to Pripyat. 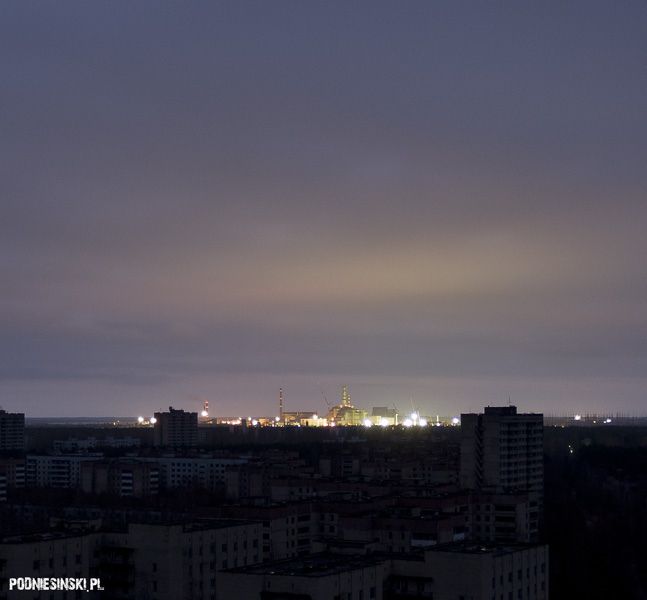 I’ve visited Pripyat many times by day, but so far never by night. I was curious. 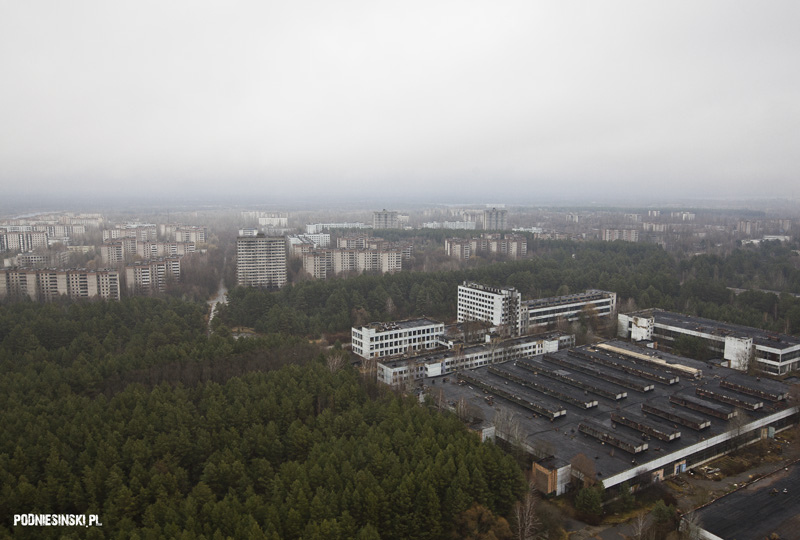 The view of Pripyat and the nuclear power plant from the 16th storey roof. Click on the picture to see the location of the place from which the picture was taken. Traditional radars work on the sight line, which means that the curvature of the earth effectively reduces their scope to several hundred metres. This type of radar, however, has an insufficient range for early detection of a nuclear attack from the United States. At the end of the 1950s, the USSR began work on building an over-the-horizon radar whose range would far exceed the horizon. The basis of its activity hinged on transmitting an exceptionally powerful signal in the direction of the ionosphere which, after being reflected from it, reached a place located far beyond the traditional field of view of normal antennae (beyond the horizon). A small part of this signal came back and was collected by huge complexes of antennae, and the signal was given for analysis by advanced computer systems. 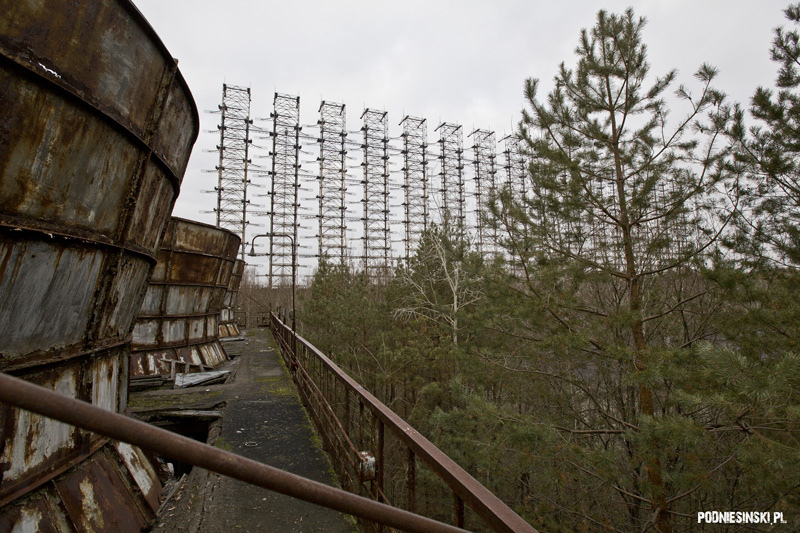 One of these installations was activated in 1976 not far from Chernobyl – the DUGA-3 radar station. It is still one of the largest antennae of its type in the world and the cost of constructing it exceeded the cost of constructing the nearby nuclear power plant. In this period it was the largest project by the USSR and to this day it is a true masterpiece of mechanical engineering. From the very beginning it was a secret building and to deflect attention it was called the radio-telecommunications centre. So many people worked there that a little town had to be specially built for them nearby. Duga-3 in the fog. Click on the picture to see the location of the building on Google Maps. “Krug” Ionosphere Control System. Click on the picture to see the location of the building on Google Maps. Installation work was uncovered immediately by radio operators from around the world because the signal generated by the antenna was able to effectively jam radio and television broadcasts and even communication with long-distance aircraft. The quickly-discovered origin of the signal and its characteristic sound, resembling a woodpecker, led to it being dubbed the Russian Woodpecker. 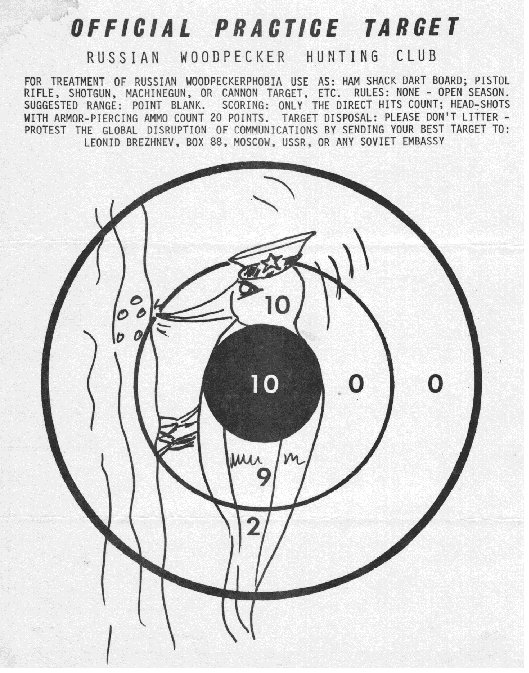 Despite numerous protests, the USSR initially didn’t even confirm that the signal came from them. Only as a result of protests by a larger number of institutions and countries did the Russians admit to carrying out tests and announced works intended to reduce interference. The whole world wondered what the Russians were doing these tests for. It was suspected that they were testing a new form of communication that was meant to replace satellite communication, which is very unreliable during war. Others believed that they were testing a new form of communication with submarines. Conspiracy theories also appeared that the Russians were building tools to control people’s minds. But the one met with most frequently, and as it turned out closest to the truth, was the system of early detection of objects. To this day it is difficult to find credible information about the radar. That is why information obtained directly from the participants of these events is highly valuable, and not just any old information. Vladimir Musiec is the last commander of the DUGA-3 radar complex. 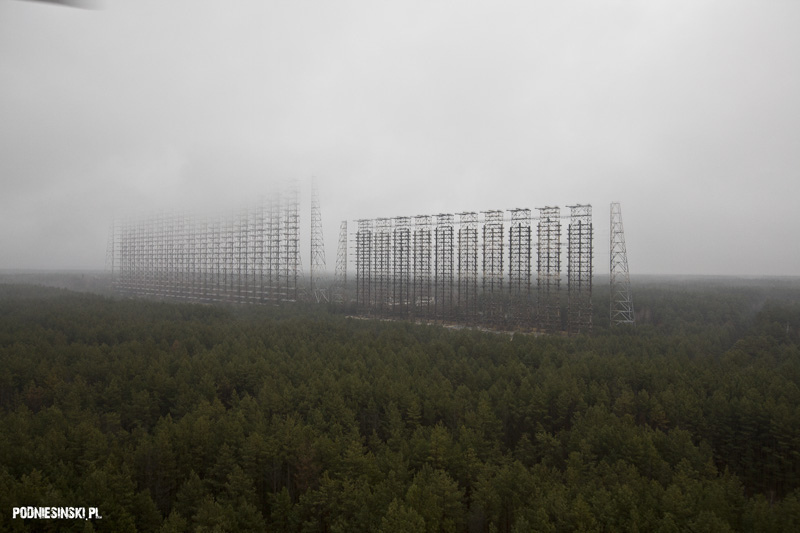 Vladimir began work in the complex in 1976, that is, several months before the activation of the radar. He initially worked as a personnel manager and eight years later he became the commander of the radar. He was in this position until it was closed, that is, until August 1988. He confirms that the real task of this radar was detecting rockets within the first 2-3 minutes after launching. Such a rocket flies from the USA in about 25-30 minutes, which means that the command had enough time to take the appropriate countermeasures, in other words, in accordance with the military doctrine that was binding at the time, to make a retaliatory attack. The radar was very modern for its time, digital technology had already been used in it in 1980. The equipment never gave false warnings about over-flying rockets. 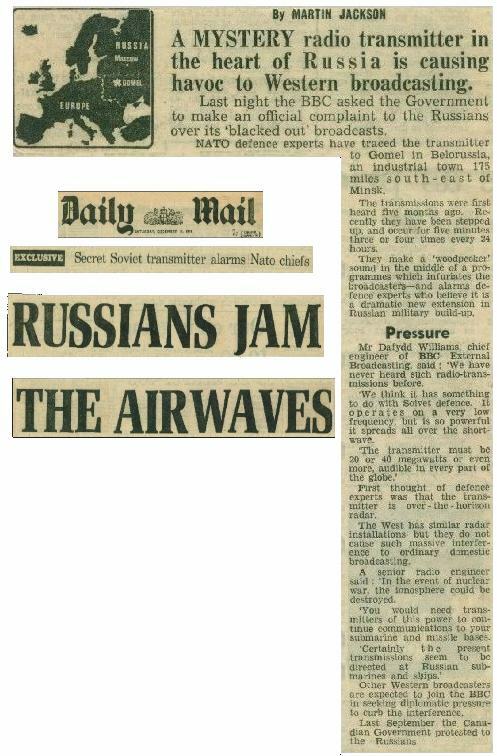 Quite the opposite, the famous events on September 26th showed that the antenna’s work could prevent global nuclear conflict. You can read more about them HERE. On 26.04.1986 the explosion in the nuclear power plant unexpectedly put a stop to the work of the radar. 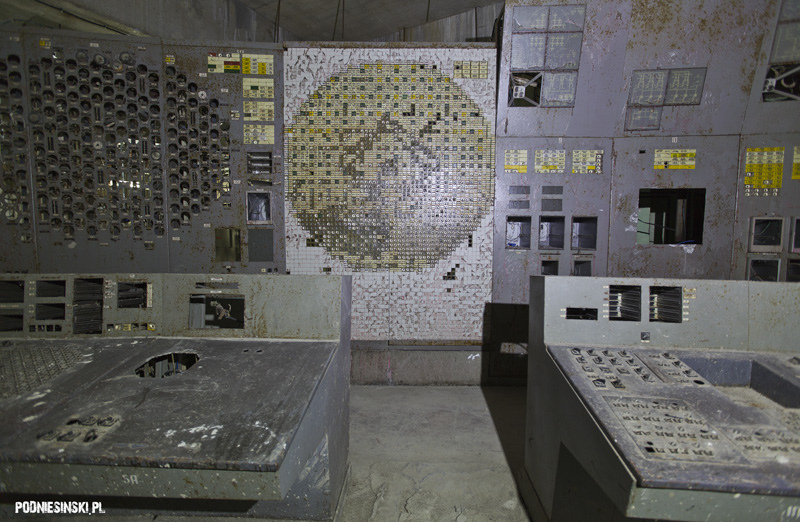 It was turned off the next morning in fear that radioactive air would leak in through the building’s ventilation systems which could destroy the computers and other electronic equipment therein. Unfortunately this result was not achieved and since this time the radar has been silenced forever. For a year and a half they tried many times to decontaminate the structure and activate it again. With no results. Returning to the present, the radar complex is very large, it’s not possible to visit it in the course of one visit. This time I visited several new places. 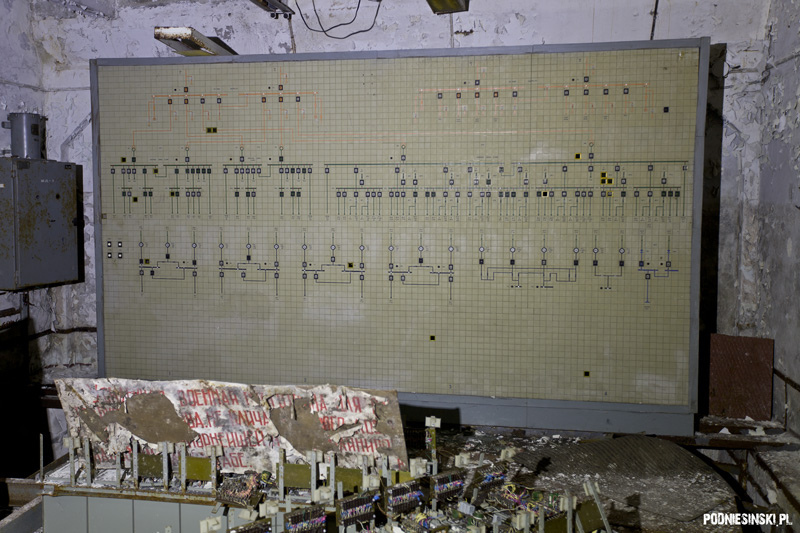 The main safety panel of the transformer station. Exhibition hall. In the background a model of the globe explaining the principles of performance of the over-the-horizon radar. Giant ventilators? A structure of the radar complex that I have yet to identify. Click on the picture to see the location of the structure on Google Maps. 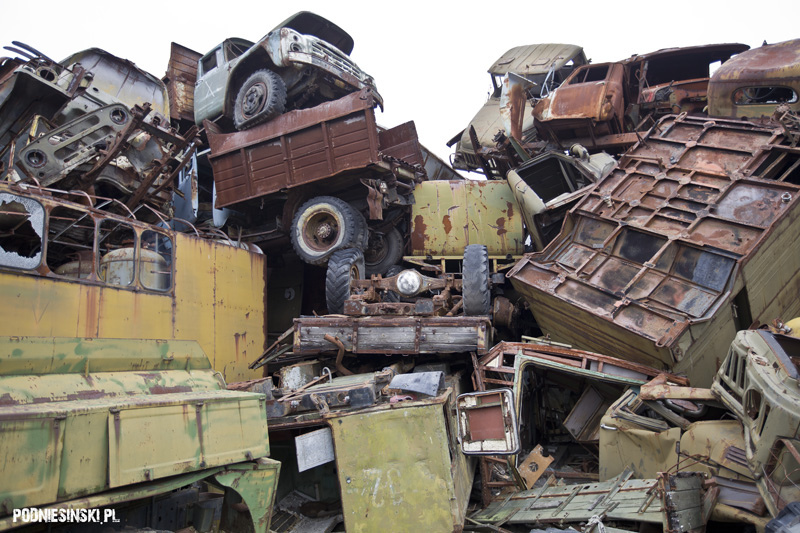 I visit the vehicle burial ground in Rossoha every year. 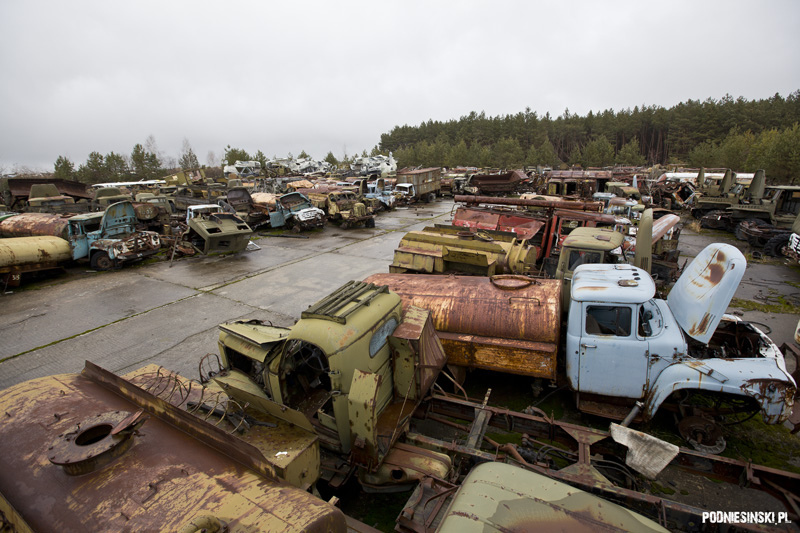 The setting of the storage yard and its large area always made it difficult to estimate how many vehicles remain here. But this time there was nothing left to estimate. Besides several choppers and a dozen or so buses, there was nothing left. And just a few years ago there were over 1500 vehicles here that were used to liquidate the results of the accident. Hundreds of trucks, buses, fire trucks, bulldozers, military vehicles and choppers. The burial ground has just ceased to exist. 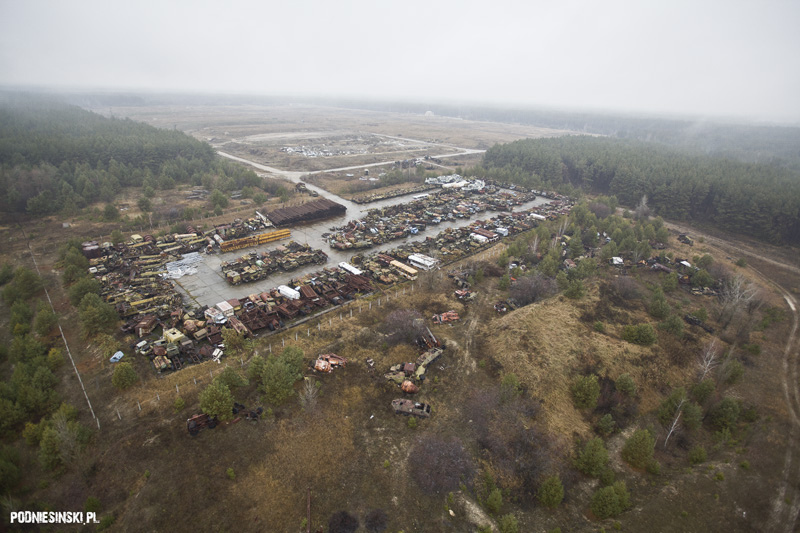 If you click on the picture below you will see pictures of the storage yard from times when it was still full of machines. Empty machine storage yard. Click on the picture to see the view of the storage yard from a few years ago on Google Maps. The square where the machines from the storage yard in Rossoha are stored. The storage yard in Rossoha is in the background. Click on the picture to see the view on Google Maps. 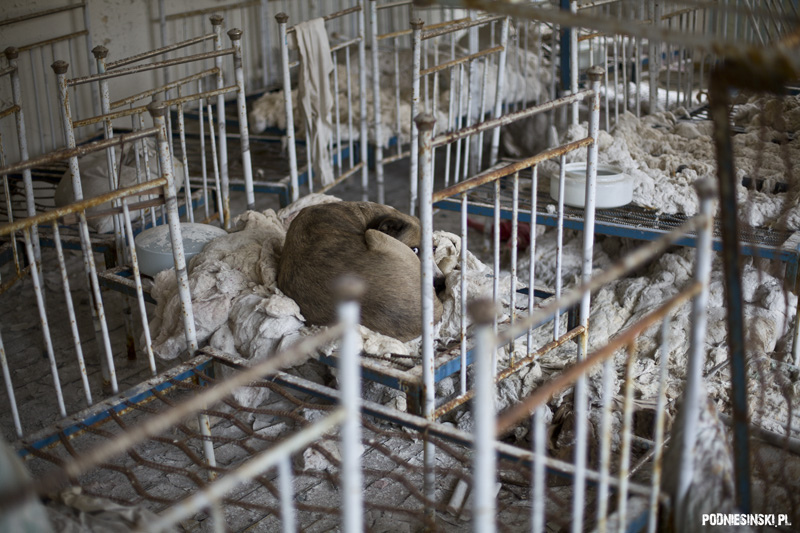 Buriakivka is a storage place for radioactive waste. Occupying almost 100 ha, the object consists of 30 giant ditches (150×50 metres) in which radioactive waste from the whole zone is buried. Of the 30 ditches, 28 are full and covered with earth, 1 is currently being filled and only one is still free. 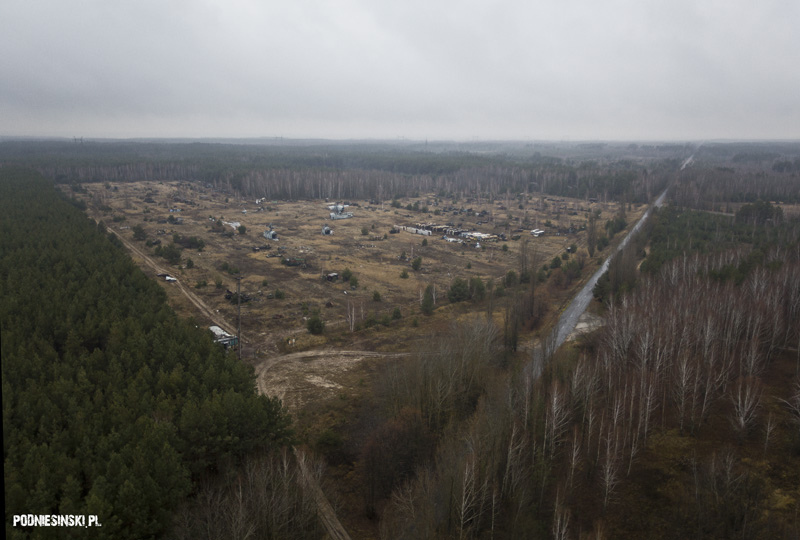 The first 3 ditches were already filled in 1986 and contain mainly things from Pripyat. Furniture, domestic appliances, goods from shops and even valuables and money. All collected to counteract attempts of theft and transporting radioactive items from the contaminated city. But not everything was buried. 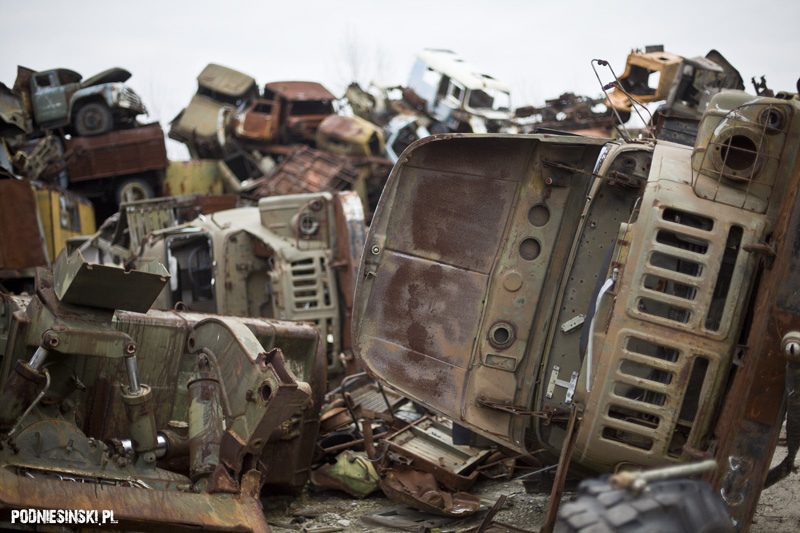 Many machines that took part in liquidating the effects of the accident were so highly contaminated that, like in Rosocha, no one knew what to do with them and they were left beside the storage yard. There are over 500 of them here. 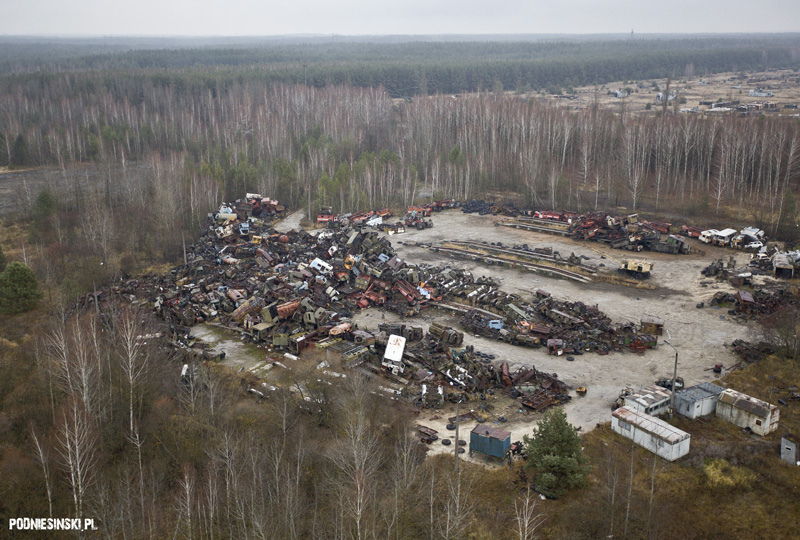 Machine storage yard in Buriakivka. In the distance a large tract of land under which radioactive waste is buried. (On the lower right corner you can see the ditch in which radioactive waste is currently being buried). Click on the picture to see the view on Google Maps. 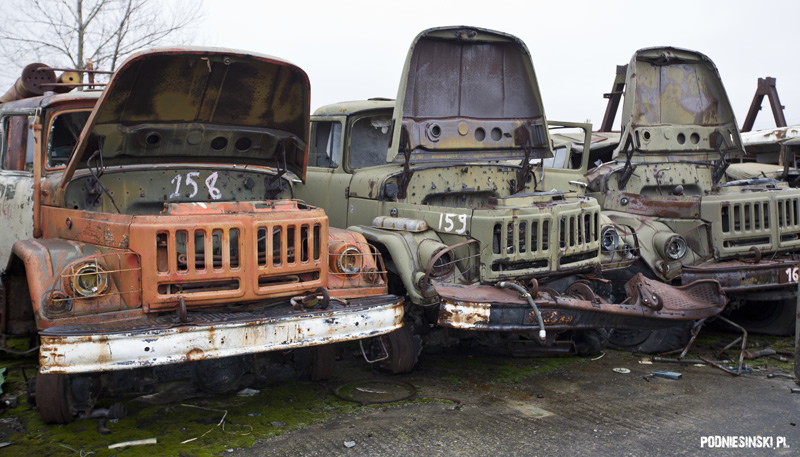 In the storage yard I also found wrecks of MI-24 military helicopters. 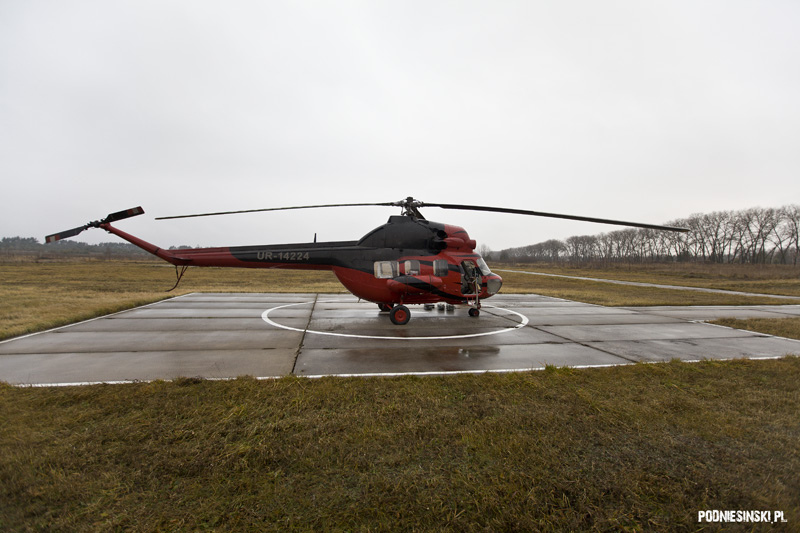 In the closed zone MI-26, MI-6 and MI-8 helicopters were also used but only the MI-24 was equipped with special equipment to measure the level of radiation in the air. The crew was sealed inside a hermetic cockpit fitted with special filters and air conditioning. Many times it flew very low and slowly over the reactor, testing the level of radiation in specific control points. 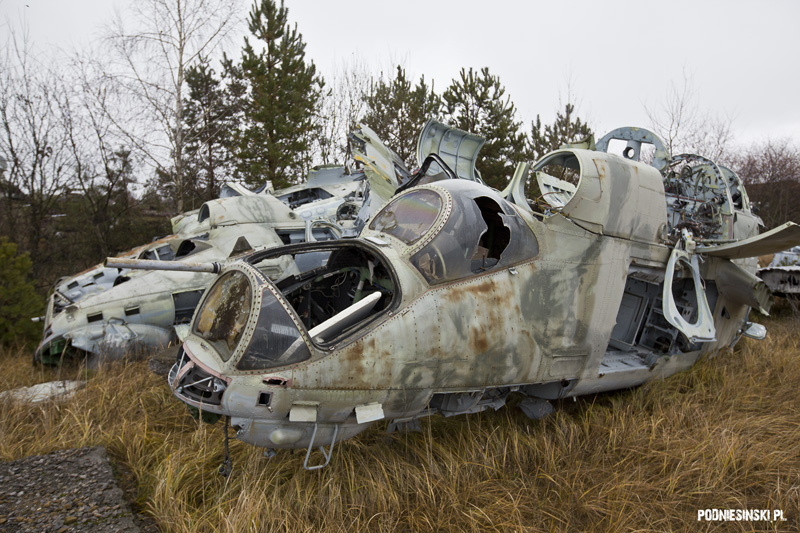 Two wrecks of MI-24 choppers. 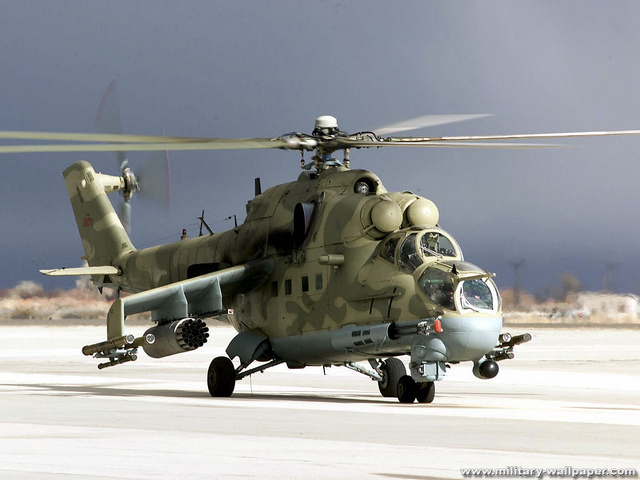 Click on the picture to see what a new MI-24 looks like. To conclude I must correct my previous statement that there will not be a sequel to the film Alone in the Zone. After over a year spent on trips and production for Alone in the Zone I was convinced that there weren’t that many new interesting places. After several failures in obtaining authorization to access block 4 I thought that I would never manage to show this place. And besides, sequels tend to be worse than the first part, so why disappoint all the fans of Alone 1? I’ve changed my opinion. I already have several new, interesting places, visions and ideas for new ones. And I promise to try to avoid the rule of sequels. But you have to keep waiting, I need at least 2 more visits to the zone. But I already know that Alone 2 will only be available to people who have the first part. This is a gesture of thanks to them because it was those who bought the film that led to its success. If you don’t have it yet you are invited to here. Premiere in 2013. If you are a photographer, are at least 25 years old and want to join the next trip, write in giving information about yourself to the address arek (at) podniesinski (dot) pl .